On June 22, 1876 Matthew Astor Wilks stunned real estate men country wide. Five months earlier, on January 22, he had begun buying up the parcels at the southwest corner of Broad and Wall Streets. On that day he purchased No. 19 Wall and Nos. 4 to 6 Broad Street. Now, determined to acquire No. 21 Wall Street, he now spent $168,000 for the old property--a staggering $330.70 per square foot (more than $7,000 in 2016), "by far the highest price ever paid for land on Manhattan Island," according to the Real Estate Record & Builders' Guide. By 1884 the millionaire businessman and investor had added Nos. 15 and 17 Wall Street to the holdings, giving him control of one of the most desirable chunks of property in Manhattan and, indeed, the country. Wilks' total outlay for the properties was $891,000. The plots were filled with a mish-mash of structures occupied by bankers and brokers. On May 11, 1889 The Real Estate Record & Builders' Guide commented "The most valuable corner on this continent is now in a sad condition. But it will not be for long." The journal reported that Matthew Wilks was in the process of demolishing the old buildings so he "may be able to start in at once to build his ten-story office building on the spot." A separate article that same day noted that architect Charles W. Clinton had filed plans for a building "worthy of its site." "The new building will be constructed entirely of limestone, in the Romanesque style, with a mansard roof." 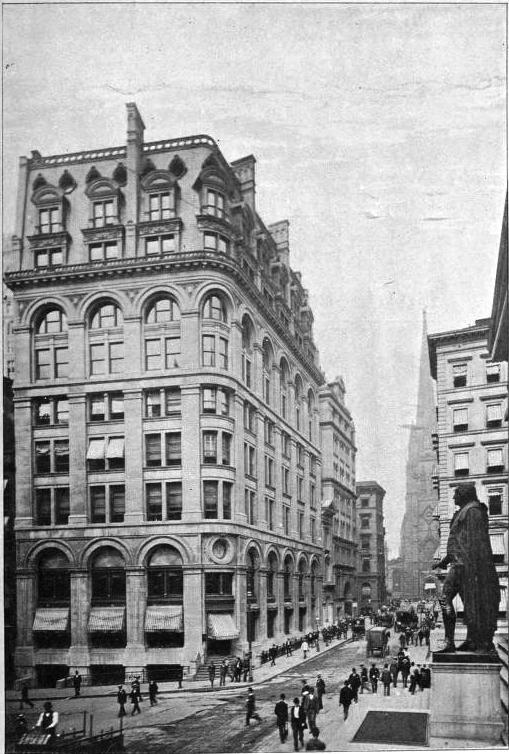 Known as the Wilks Building, it was completed in 1890; but not before frustrating labor problems and and an explosion. On October 1, 1889, as the building was in its last stages of construction, The Evening World reported "The Union workingmen made another attack on Peck, Martin & Co. this morning, by striking on the large eight-story Wilkes [sic] building...150 men dropping their tools and leaving the structure." The carpenters remained on strike until February 20, 1890 when they won their fight for higher wages. Before then another incident had come in the form of an explosion. On the night of December 11, 1889 Policeman Grosjean heard the blast around 10:00. He sent out a firm alarm and rushed to the unfinished building where he found the tool house inside on fire. As it turned out, the explosion was not connected to the labor troubles as initially suspected. The Sun explained the following day "Charles Egan, the night watchman, had been sitting in the tool house, with a kerosene oil lantern on the floor. The lantern exploded, and slightly burned Egan." The completed Wilks Building was an imposing presence. The eight-story tripartite structure supported a two-story mansard. Multi-level arches created a rhythm, uninterrupted by the it's rounded corner. The mansard, sitting above a decorative balcony which fully wrapped the building, featured ornate, double-height dormers and sliver-like chimneys. A pierced stone railing acted as roof-top cresting. The first three floors were dedicated to banking purposes, while the upper floors contained offices. The Wilks Building was described as "absolutely fireproof" with hardwood finishes and "cabinet trimmed." Because of the still-unreliable electricity, light fixtures were designed for both gas and electricity. The Record & Guide mentioned that among "all modern improvements" were "two fast-running elevators." Gustav Kobbe, writing in his guidebook New York and Its Environs, called it "sufficiently imposing to make it worthy of its costly site." Firms like H. B. Hollins & Co., "general bankers," moved in. Hollins & Co. described itself as "dealers in Government, Municipal, and railroad securities." And Matthew Wilks no doubt thought himself amazingly fortunate when Colonel George William Cameron Leybourne appeared in New York in December 1889 with what The Evening World described as a "prodigious idea." Leybourne announced he had been sent to New York by the Rome "to establish the Universal Association Bank and Trust Company in this city under special benediction of the Pope, with a capital of $100,000,000, to receive, care for and invest not only the enormous revenues of the Church, but the private fortunes of its members." The World noted "The announcement created a sensation in Wall street. The bank was to have the sanction and support not only of the Vatican, but the foremost Catholic prelates and financiers of the world." Leybourne took the second floor and basement of the Wilks Building. "The basement was to be fitted up with fire- and burglar-proof vaults, and the second floor was to be used as the main office." Despite the apparently endless amount of funds at his disposal, the 60-year old Scotchman and his wife moved into a "cheap flat at 133 East Twenty-sixth street," according to The World later. He explained that curious choice as "simply to escape the importunities of people who had learned of his great idea." It would be months before Leybourne was exposed as a fraud. The good impression he had initially garnered became suspect, first, when Archbishop Corrigan repudiated him. Leybourne tried to fix the problem with tempting a bribe. "All this did not abash the Colonel and he again approached Archbishop Corrigan, this time with a bribe of 10,000 shares of stock. He was kicked out of the rectory, and when the Pope denied over his own signature that he had ever countenanced the banking scheme, Col. Leybourne's career in this country came to an inglorious end," explained The Evening World. Leybourne fled New York, leaving two important floors of the Wilks Building untenanted and their rent unpaid. A year later, on July 29, 1891 The World reported an unsettling development. "A cable from Rome this morning announces that Col. Leybourne, who astonished the world some eighteen months ago with a daring financial scheme, had attempted suicide there yesterday in the Japanese style, hari-kari, by disemboweling himself with a razor." Although he was found still alive, there was little hope for his recovery. Nonetheless The Evening World ran the callous headline "Failed Even At Hari-Kari." 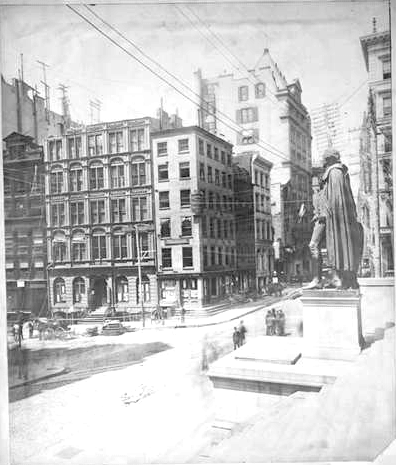 In 1902 foundations were being blasted for the new Stock Exchange Building next door. The process resulted in unnerving consequences to the Wilks Building. 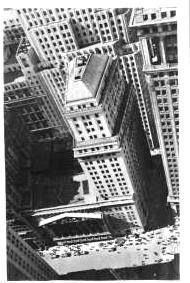 On February 2 The New York Times reported "The foundations of the new Stock Exchange have been sunk by pneumatic caissons to a depth of seventy feet below the street. 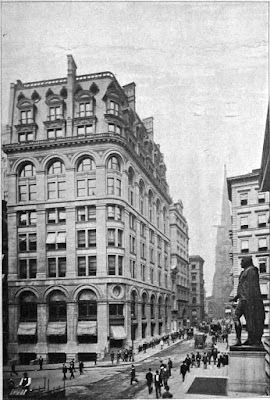 As a result the Wilks Building, in which are the offices of H. B. Collins & Co., bankers, and numerous others...has slid back from Wall Street, to a distance of an inch away from where it originally stood." The noticeable movement of the structure resulted in the elevators being stopped so new siding could be installed. "The back of the structure has gone a little further than the front, and as a consequence there is a large crack to be observed right up through the building." On the Wall Street side, a gap between the building and the sidewalk showed how far the structure had migrated backwards. Rather astonishingly, the newspaper wrote "Building Inspectors have examined the structure very closely, and say that there is no longer any danger." In spite of the crack and skewed angles inside, business went on as usual in the Wilks Building. In January 1910, for instance, bankers Harris Winthrop & Co. took the banking floor and portions of the second and third. Because so many British banking firms established their American headquarter in the Wilks Building, it earned the popular nickname "London." The Times later recalled "A firm located there would be spoken of as being in 'London.'" Then, on July 19, 1919 The Record & Guide reported that the New York Stock Exchange "is reported to have negotiations well advanced for the purchase of the Wilkes [sic] Building." 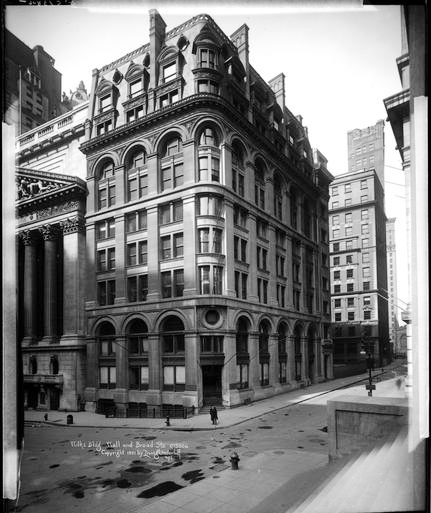 The Exchange had already purchased the Mortimer Building, directly behind the Wilks Building on Wall Street. "The exchange has long been desirous of enlarging its home to meet the greatly increased business," The Guide explained. As soon as the Mortimer Building was razed in mid-July 1920, demolition of the Wilks Building began. The New York Times remarked that their destruction "has removed two well known landmarks from the financial section." 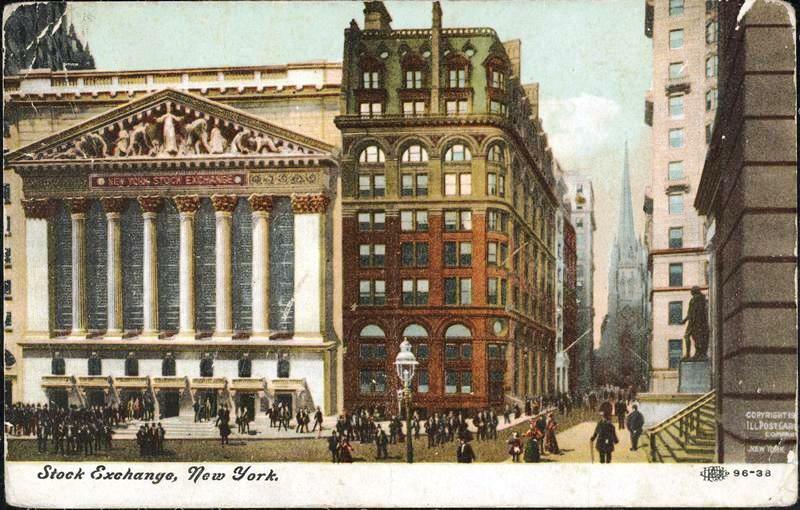 In its place the 23-story Stock Exchange annex building designed by Trowbridge & Livingston was erected, which survives. I believe that Matthew Astor Wilks was married to Sylvia Green, daughter of phenomenally successful investor and notorious miser, Hetty Green. The 1895 P. A. Fogarty Stable -- 11 Spring St.